The harsh winter, which set cold records in many regions, has been a trial for many Canadians. For some bugs, though, the fluctuating cold temperatures could be even more challenging, if not downright fatal. Some entomologists are particularly concerned about how honeybees and butterflies are handling the cold weather. 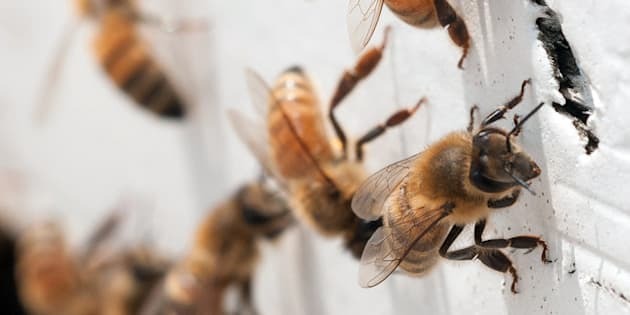 "More than 30 per cent of the honeybees could be killed off," says Evelyn Boychuk, an animal biologist and specialist in insect cold tolerance. Honeybees hibernate in hives throughout the winter, unlike other insects, which either migrate or avoid cold by burrowing in soil or moving indoors. The bees rely on pollen from flowers for fuel, but the prolonged cold weather has also affected the spring growing season. If there are no flowers for honeybees to feed on when they come out of hibernation, the insects could starve. According to Boychuk, the lack of sustenance could also affect butterflies, as they spend the winter as larva, surviving without food all winter and during metamorphosis in the spring. Boychuk says for “sensitive” species such as these, factors like when hibernation begins, how long they hibernate and when they come out can influence their survival rates. John Klymko, director of the Maritime Butterfly Atlas, says although they don’t have records yet, he suspects there won’t be a noticeable decline in butterfly populations this spring. He says butterflies are a resilient species and will most likely have fared well through the winter. Even so, he says extreme winters in the future could affect how many insects "overwinter," a term entomologists use to describe how an insect survives the snowy season. “In general, if habitats become degraded by global climate change, some species will become less resilient or more vulnerable to any sort of hardship,” says Klymko. Although bees might be having a rough go of it this spring, the news for Canadian cottagers is that mosquitoes and blackflies will most likely be as plentiful as always. According to entomologists, these insects are well adapted to the Canadian weather and can survive in the cold. Boychuk says mosquitoes and blackflies probably spend the winter under blankets of snow, where temperatures stay around zero degrees Celsius, so they don’t feel the cold the way we do. “A lot of snow cover insulates those habitats that insects like to use in the winter, like soil and leaf litter and things," says Brent Sinclair, an associate professor at the University of Western Ontario who researches cold tolerance in insects. However, in areas with extreme temperatures but little snow cover, there can be what&apos;s called "cold frost penetration.” Sinclair says this phenomenon occurs when frost travels deeper into the soil as a result of cold temperatures occurring without snowfall to insulate the soil. Cold frost penetration could expose hibernating insects to lower temperatures, and as a result lead to a decline in insect populations, says Sinclair. He points out that the colder-than-usual temperatures may actually benefit insects such as mosquitoes and blackflies in the reproduction department. During hibernation, a mosquito&apos;s metabolic system slows down, allowing it to conserve energy. A longer winter means more stored energy, which could lead to greater reproductive activity in the spring and thus a spike in their numbers. “I could argue that some of these species will actually do better, that they’ll actually be able to produce more eggs for babies early in the season, which could lead to an earlier bug season,” says Sinclair. Even so, it’s hard for entomologists to predict what happens to each species over the course of the winter. “Each insect responds to cold temperatures in different ways,” says Steve Marshall, entomologist from the University of Guelph. “Some have antifreeze like we have in our cars that stops them from freezing. Some of them avoid cold temperatures by going down into the soil and into tree trunks. Some leave town altogether. Some just die and repopulate the area from southern locations every year,” says Marshall. “It’s very difficult to tell."